Sprucing up the bathroom can transform not only the most intimate area of the house, but the whole home too! Your bathroom is where you prepare for the day ahead, a place to wash away stress and take care of your outer appearance. A clean and tidy bathroom is so important to us they can even add extra value to the home. You want to get this space right, which is why many of our customers are choosing Geberit. 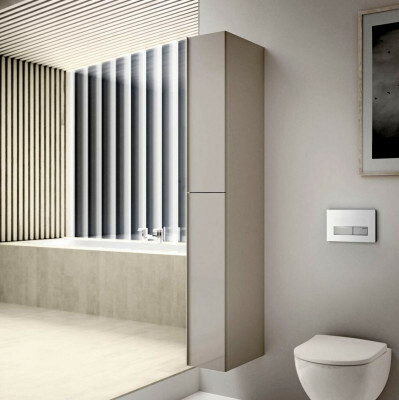 Geberit are leaders in bathroom products, they add value without lacking style and function. They care about the planet and produce excellent water saving and energy efficient solutions, which offer homeowners peace of mind when it comes to their buying choices. If that’s not enough to sway you, we have three more reasons why you should choose Geberit. Reading this mini-list may just result in the transformation of your bathroom, en-suite and even your lifestyle! Look at some of the best-selling Geberit sanitary products and you’ll notice that they are designed to perfection. From the vanity unit to the toilet, expect simple lines that result in a contemporary space. When looking for a high-end finish, Geberit doesn’t fail! Floor standing toilets are proving to be hugely popular this year. The design of the Geberit toilets save an enormous amount of space in the bathroom and maintains that modern, clean look that works so well in contemporary bathrooms. Many bathrooms need to be carefully designed to make the best use of the small space provided, something especially true with en-suites. Geberit have taken space into consideration, creating products that look like pieces of art, which also work well in the smallest of rooms. The Acanto small projection vanity unit is an excellent example of space saving design without compromising on style. The unit provides compact yet spacious storage space, perfect for hiding away all those beauty products and bathroom essentials. Thanks to the beautiful design the bathroom will always look clean and clutter free, helping to create a feeling of space. A Geberit bath is a beautiful addition to any bathroom. Choose from double-ended to single and select the perfect size for the space you have available. Baths are still popular with house buyers and are the perfect way to unwind after a busy day. Choose Geberit to create a contemporary bathroom that will flourish now and for years to come! Check out our great range of Geberit products today, or contact us to find out more!